Few parts of the body are more susceptible to wear and tear than the knees. In the United States, knee problems are the second most common source of chronic pain. Knee pain and swelling can be profoundly inhibiting. Prominent athletes are frequently sidelined by knee swelling. People trying to lose weight end up in vicious cycles of overworked, swollen knees getting in the way of exercise. Knee pain can also be a debilitating element of arthritic conditions. The adverse effects of knee swelling are virtually endless. Fortunately, knee swelling is a very treatable condition, even when it’s not totally curable. As cannabis becomes more and more commonplace in the medical world, its healing potential for knee swelling becomes more apparent. Topical creams have been effective in healing knee joint-related ailments. When infused with cannabis, they may be even more effective in treating substantial knee swelling. Those without prior experience with serious knee swelling may wonder what exactly is happening when this particular ailment arises. Knee swelling, or knee effusion (also known colloquially as “water on the knee”) is a condition in which excess fluid begins to build up around the knee joint. Excess fluid in the knee is largely responsible for the pain and rigidity associated with knee swelling. The route to reducing knee effusion mostly depends on its underlying cause. Most doctors will wait until they know the exact nature of a knee swell before they embark on a treatment plan. Knee swelling has an enormous list of causes, arguably the most common of which being sports-related knee injuries. Athletes frequently experience ACL tears, which lead to particularly painful swelling. Osteoarthritis can cause knee swelling when cartilage degradation induces an excess of fluid in the knee joint. Rheumatoid arthritis is also a fairly common source of knee swelling, though symptoms are usually more prevalent in other joints. If a fluid buildup in the knee gets too extreme, it can develop into baker’s cyst—a painful fluid-filled sac behind the knee. Extreme knee effusion may also lead to muscle loss. It should come as no surprise that the older you get, the more likely you are to experience knee effusion. It’s should also be fairly obvious physically active people put themselves more at risk of knee swelling (excessive runners and joggers are particularly at risk). Because the knees do so much work to bear weight, obesity also puts people at a higher risk of experiencing swollen knees. Other risk factors include previous injuries and surgeries, drug injection, smoking, bacterial infection, and medications that inhibit the immune system. Ice – Reduces swelling and pain by slowing blood flow. Compression – Braces that efficiently compress the knee can be helpful. Elevation – Elevating the knee above the heart can help reduce excess fluid. Rest – The more pressure one can take of the knee to reduce swelling, the better. In addition to initial self-treatment, there are plenty of things a person can do to reduce the risk of knee swelling. If you know the right and wrong poses for it, yoga can be a highly effective way to either prevent or reduce knee pain and swelling. Making dietary changes and being smarter about exercise (i.e. avoiding exercise methods that put too much stress on the knee) can also go a long way in reducing the risk of a swollen knee. Self-care methods are often enough to treat a swollen knee, but it’s important to know when it’s necessary to seek medical attention. Mild swelling is seldom a thing to contact a doctor for. Once the knee becomes severely or abnormally swollen, however, professional help and diagnosis is probably required. So what constitutes “abnormal”? If a person cannot straighten or bear weight on the knee, medical attention is definitely necessary. The same goes for when they’ve developed a fever, or the knee itself feels hot. Duration can also be a factor. Most doctor’s suggest medical attention if the swelling has lasted longer than three days. Medicine for inflammatory illnesses has changed significantly since the advent of medical marijuana in the U.S. One of the reasons cannabis has become an increasingly popular treatment method for inflammation and swelling is its two-pronged effect: it can alleviate pain while simultaneously reducing inflammation. Cannabis has enormous anti-inflammatory potential because of the way it interacts with the body’s cannabinoid (CB1 and CB2) receptors. The plant’s cannabidiol (CBD) content may reduce inflammation while THC—the psychoactive component of cannabis—helps with the pain. Topical creams are a longstanding remedy for knee swelling. Though yet to be clinically proven, topical creams infused with cannabis and CBD have enormous potential to provide the same topical healing. When combined in creams with other topical remedies like menthol or peppermint, cannabis may offer the same localized pain relief by way of the endocannabinoid system. There are a few reasons someone with excessive knee swelling might try a CBD-infused topical cream before taking it orally. In states with stricter cannabis laws, CBD cream may be more readily available. It’s also an incredibly low-risk product to experiment with—absent of THC’s psychoactive effects, and much more easily incorporated into a pre-existing treatment plan. 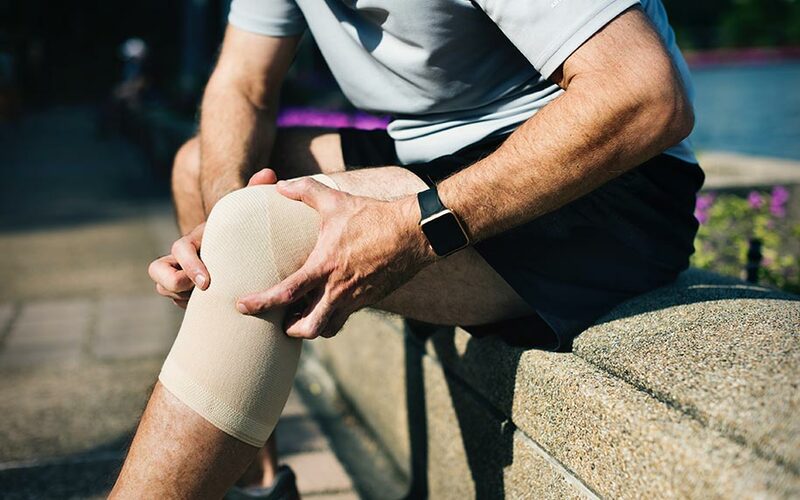 A full cannabis strain may be the better option for extreme cases of severe arthritic illnesses, but there’s certainly a place for cannabis topical cream across the spectrum of knee swelling treatment.